In Western media South Korea is often presented as a model nation, one that has achieved democracy and economic growth in a short period of time. Its position next to the authoritarian North Korean state serves to accentuate South Korea's standing as a liberal democracy. But within South Korea the dominant theme in social discourse is hopelessness for the future of the nation, especially in terms of declining birth and marriage rates, a high cost of living and an economic model that can no longer thrive simply based on state support. Among young people in particular, the idea of effort as a key factor for success is being discredited. 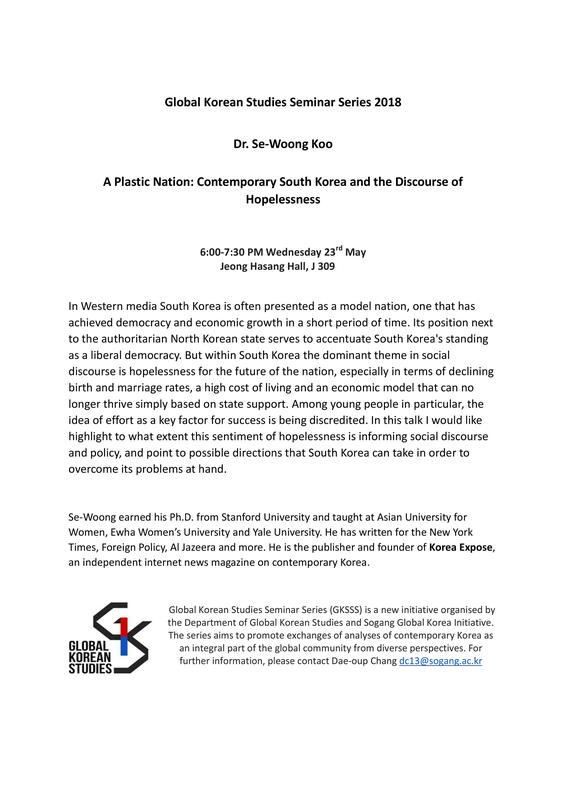 In this talk I would like highlight to what extent this sentiment of hopelessness is informing social discourse and policy, and point to possible directions that South Korea can take in order to overcome its problems at hand. Se-Woong earned his Ph.D. from Stanford University and taught at Asian University for Women, Ewha Women’s University and Yale University. He has written for the New York Times, Foreign Policy, Al Jazeera and more. He is the publisher and founder of Korea Expose, an independent internet news magazine on contemporary Korea.